Early on the morning of St Patrick’s Day, I found myself on Skype talking to someone in Australia who I’d previously only ever seen on a stage in Belfast over 28 years ago; when his band were supporting Kiss. 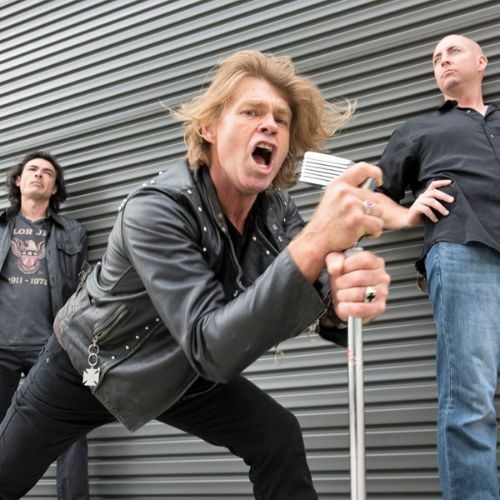 Jeff Hoad, the former front-man of Kings of the Sun has returned with new music from The Rich and Famous – the band he and his brother Clifford had originally formed after the demise of the Kings of the Sun. The interview has been transcribed and posted below. Our second guest on the Show is former American Idol contestant James Durbin who was recently revealed as the new Quiet Riot vocalist. NI ROCKS – Hi Jeffrey, thanks for taking some time to talk to Rock Radio NI. You’re about to release some new music from The Rich and Famous and it’s great to see you back in the music scene. Tell us who you’ve worked with on the new EP – who produced it and who is playing on it? JEFFREY – Govinda Doyle was the producer and recorder, I suppose I helped produce it. And it’s me singing and playing guitar, Dean Turner on bass and Dean Reeson on drums – two Deans! NI ROCKS – Where was it recorded? JEFFREY – It was recorded in Govinda’s studio up in the hills at Terranora (near Coolangatta, New South Wales); in a tank. It’s an old water tank that he has converted into a studio. It’s an old concrete water tank and it’s pretty outrageous – it’s like a house in a water tank. There’s a few bands that record there – an Australian band you might have heard of called Hat Fitz And Cara – an Irish chick, you might know of them. They recorded there as well. It’s pretty bizarre, it’s like going down into the vault. NI ROCKS – My first thought when I heard the new tracks was of the third of the Rich and Famous albums – and the best one in my opinion – “Stand Back…Prepare to be Amazed”. Was that the kind of sound you were aiming for with the new material? JEFFREY – As you probably know my brother and I have parted our ways. We did three Rich & Famous albums and this is the first one without him. I sort of took a hiatus and then all of a sudden the other two guys said do want to come and do a gig and I thought why not. From the gig it moved to writing new songs. I just had this outburst of creativity and it just went from there. We never really had a plan. As a matter of fact, the first single from the EP that was done, “Take Us To Your Leader”, when we went down to record it we’d worked on it so much, but never really had a finished version of it. So we did all the other tracks and I really wanted to do “Take Us To Your Leader” which became the title track, and probably in my opinion the most original and most strong track on the EP. It was almost like a throw away thing, but we knew we’d worked on it that much that we had to put it down, so we did a finalised version on the day and it worked. NI ROCKS – You mentioned your brother Clifford who has now released a couple of albums under the name Clifford Hoad’s Kings of the Sun, and I have to say that I was happy to see that you were reviving the Rich and Famous name and releasing new material. That band never really got the credit it deserved in my opinion. Why was that the case do you think? JEFFREY – I think about the amount of money that was spent on Kings of the Sun, while we were an independent thing, The Rich and Famous. We toured the world with RCA Records and played Belfast. We earned a lot of fans under the name Kings of the Sun and when we decided to change the name, no-one really knew why and no-one really heard about it. Music had changed at that point and I didn’t want to go back. I wanted to go forward with The Rich and Famous. Now he has gone the other way and we both get our slices of the pie and we’re all happy with that. I’m happy with the band’s focus. It’s a bit more out there than Kings of the Sun would be. NI ROCKS – The new EP is released at the end of the month. Are there firm plans in place for a full album and when might we see that? JEFFREY – Oh, there are definitely plans. We’ve got so many tracks, I swear to god! We’d said that we’ve gotta record something and went down there to record four tracks and ended up recording “Take Us to Your Leader” as the fifth track. But, we’ve probably got about 15 really, really good ones. We’re a bit time-poor all of us, all three members. That’s why we just started with an EP, though all the powers that be; well not powers that be, just people; said that there was no point doing a full album these days until you can get some kind of perception of where you are heading. And it’s financial of course and about how much time you’ve got. But we’ve definitely got more tracks to put out there. Once you’ve got the finished product in your hand it’s like, aaaggghhh, we should have done this or we should have done that track! But just getting to where you are with those tracks is like....I remember back in the Kings of the Sun days thinking my god we just spent all this time on this little cassette – it was cassettes back in those days – my god is that it!! It felt like a little band of music – a little piece of black tape! So much effort goes into it and it doesn’t seem that much at the time, but by god it’s a lot of effort to get you there. NI ROCKS – Timeframe then? Roughly, later this year for the full album? JEFFREY – We’ve definitely enough for the full album. How we do it is another thing. Govinda, the guy who produced and recorded it is very high profile. He does music in all different genres, He kinda did it; I wouldn’t say as a favour, but he’d done the other Rich and Famous albums and he knew we were independent so he did it in our own timeframe and his timeframe. So it took quite a while. But I’m sure he’d be up for recording the rest of it, because he has made it sound great. It sounds awesome. NI ROCKS – That was actually my next question. You’ll work with him on the rest of the album then? JEFFREY – Yeah, I’d like to. Unless Kanye West wants to produce it or something! (Laughs). NI ROCKS – Nah, you wouldn’t want him! JEFFREY – (Laughing) No I definitely wouldn’t! Maybe Phil Lynott or Rory Gallagher! Two of my favourites! NI ROCKS – We wish! We’ll play a track from the EP now. Do you want to pick a track and tell us something about it. JEFFREY – Yeah, “Take Us To Your Leader” would be the first one. The name The Rich and Famous drums up a lot of imagery. It was always a bit tongue in cheek, when I named the band that. It was all happening at the time. Everybody was wanting to be rich and famous; everybody had their websites and MySpace sites and were trying to do the fame thing. I just saw the irony of it and the funniness of it. A lot of the songs on the other albums are very like that – it’s kind of a satire thing, but there’s a lot of truth in it as well. 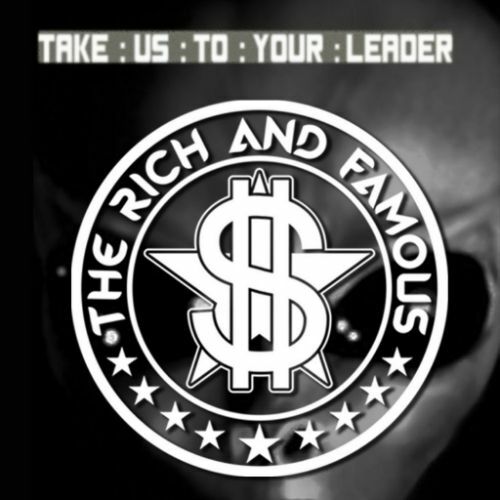 “Take Us to Your Leader” is about all the conspiracy theories – the reptilians, the illuminati and all that kind of stuff. You’re thinking, my god there are people believing this stuff. I just thought I’d do a really wild take on it and that became the first single. It’s a great track and it really drums up that feeling – “reptilian in human form, tastes so good, and your skin so warm”. “Who’s that there behind the disguise, I want to try you on for size”. NI ROCKS – Have you worked with anyone on the writing of the new tracks, and has there been any particular sources of inspiration when it comes to writing? JEFFREY – Just my brain going round! I do a lot of thinking during the day, just driving around. And as I said, I think the name The Rich and Famous tend to lend itself to what we’re bombarded with daily. We’re bombarded with this and bombarded with that! What you should be, what you should have and what you shouldn’t; and everyone has their different take on it. Everyone wants a bit of bling, but no-one wants to be a poser; but some people do! All that plays a big part in the way that I look at life – laughing at it, looking at it, checking it out. It happens in movies and it happens all around you. So I’ve got a pretty big pallet to choose from. With the name of the band and where I’m heading with it. NI ROCKS – I presume you’d like to get the band out on the road to play some gigs. Have there been any plans made to make that happen? JEFFREY – As soon as we get the EP launched we’re going to start playing out here as fast as possible. We’ve played gigs before out here before we even had the EP, so there was nothing behind it. It’s all about having all your ducks in a row. We played a zillion gigs with Kings of the Sun and The Rich and Famous and they never really amount to anything unless the rich and famous are there to see it (laughs). If you know what I mean! You could play a thousand of your best mates birthday parties, but it doesn’t get you anywhere until the rich and famous are there. NI ROCKS – Any plans to play any shows outside of Australia, or will the focus be on local events? NI ROCKS – You may not get into the States by then; you wouldn’t know! JEFFREY – (Laughing) Who knows! That’s one of the greatest mysteries isn’t it! NI ROCKS – If you were out on the road would you play some of the classic Kings of the Sun tracks on the too or stick to the new stuff? JEFFREY – When we became The Rich and Famous, my brother and I, we weren’t anti Kings of the Sun. What killed Kings of the Sun was grunge. It killed a lot of rock bands. So we felt that we had to start anew and start fresh because there was a whole new audience. Looking back at it maybe you think you should have continued with who you are and the music could change. I was glad that we did as I don’t want to go on a kind of oldies circuit. I feel that all my ideas are fresh and all my ideas are new, so I’m happy with the change of the name of the band; but I’ll still be happy to play songs that people want to hear. If people want to hear Kings of the Sun songs then I’ll play a couple for sure. Why not! NI ROCKS – When I’ve interviewed Clifford in the past, I’d asked about some of his favourite road stories from the 80s and 90s. Are there any particular events or stories that stand out for you? JEFFREY – Being gobbed on in Belfast! NI ROCKS – (Laughs) Funny, he mentioned that too! JEFFREY – He wasn’t getting gobbed on; I was! I was swallowing them! NI ROCKS – (Laughing) It was a sign of how much they really liked you! JEFFREY – I know, that’s what they keep telling me! (Laughs) I had gob marks all over my Marshall stacks for years. Every time I pulled them out of their road cases I’d go my god, they’re still on there! NI ROCKS – You famously of course had a bit of a spat with Axel Rose during the heyday of Guns n Roses. What were your thoughts about him taking over as the AC/DC vocalist recently? JEFFREY – I liked it, I really did. I don’t care what anybody thinks. I was following it on YouTube and it was like my god! We were talking about Donald Trump before! No one knows what the future will bring. How you’d possibly imagine that Axel Rose would be playing with AC/DC, one of the most closed, cloistered bands in the world. No-one ever knows who they are; you could walk past them in the street. You wouldn’t know who their wives were, where they lived or anything. Then they had that bit of trouble where Brian lost his voice and Axel sticks his hand up and says I’ll sing it! I saw the first rehearsals somewhere, recorded outside at the venue, and I thought he sounded fantastic. I had nothing but positive vibes. I’ve been a huge AC/DC fan all my life and that was so bizarre, so outrageous that it even happened; that you have to take it from a different perception. In my mind, I just thought this is extreme! They’d just lost Malcolm, the essence of AC/DC; then they lost Brian Johnson, the guy that was in there longer than Bon was. Then you’ve got Axel Rose doing gigs with AC/DC. It was mind-blowing! I just thought, I’m going to go with this. I’m probably getting too old to say no you shouldn’t or that’s not right and that’s not the right thing to do. I’ve lost all that idealism. Anything can happen. NI ROCKS – It’ll be interesting to see if he actually records a new album with them. That’ll be the big test. JEFFREY – Did you think he sounded good – the first stuff that came through. I thought he sounded great. NI ROCKS – I didn’t see them when they played here, but from what I can gather it was very good. JEFFREY - I’m not a fan of him hobbling around with a cast on his leg and sitting in thrones, but he sounded good. He was hitting notes that I hadn’t heard for a long time. NI ROCKS – We’ll play another track from the new EP from the Rich and Famous now. Would you like to pick one and tell us something about it? JEFFREY – “Dirty Music”, which is about for how long people have been saying you shouldn’t listen to that music, you shouldn’t listen to this music. They were burning Elvis records and burning early rock n’ roll records. If you think about it, if you like rock, the rock you like has some sort of sleaziness, some sort of dirtiness to it and that’s what it was written about. And we play dirty music! That was the essence of it – the fact that people could be burning music. Someone like Marilyn Manson being as extreme as they can be shows it has gone beyond it now, but back in the era when they were burning rock n’ roll records, that’s what it is about. NI ROCKS – Do you get a chance to listen to much music these days and what do you listen to when you do? JEFFREY – I live on YouTube! Going back over stuff. Way back we had very limited audio visual access. Documentaries and full live concerts and things like “The Old Grey Whistle Test” we didn’t get to see out here. So I live on YouTube going over it all – seeing bands that I’d always wanted to see live; like the Alex Harvey Band, Thin Lizzy. I like to go back over anything I can think of. Whatever comes into my head, I go searching for and watch it on YouTube. NI ROCKS – Any young bands out there that you’ve taken notice of? JEFFREY – There’s a band called Plague Vendor. Who else am I listening to....I can’t think right now. I’ll send you a list of bands that I like. I really like what Jack White is doing. He’s a nut; a loveable nut! NI ROCKS – What do see as the biggest challenge to getting the band out there now, as compared to the 80s with Kings of the Sun or ten years or so ago when the first Rich and Famous albums came out? JEFFREY – I don’t think there is any challenge any more. It’s all in your head. I’ve read a lot of stuff about a lot of bands and I think to myself, when they let go and don’t want it so badly and realise if it’s going to come to you, it’s going to come to you. We had our first big bite of the cherry with Kings of the Sun – things that were supposed to happen with bands in the days of yore when record companies controlled everything. Now, I don’t think anyone controls it at all. I think you could put anything out there and if people hear it and it is interesting enough to the ear, who knows where it could end up. I don’t think there is too much of a challenge, other than if you’re not really into social media and whatever, you’re doomed! NI ROCKS – That was actually my next question. Are you keen on the whole social media thing, or is it a necessary evil for you? JEFFREY – I’m definitely keen on it. It enables this to happen. It’s ridiculous that you’re even playing us. It’s mind-blowing, but if social media didn’t happen we wouldn’t even be talking. How can you knock it! Otherwise everything just stays in its own little groove, like in Australia. Like I was saying to a guy the other night who asked why all the Australian bands had this hard edge. That’s because, in that era of pub rock that’s all there was and you were competing against a DJ. The band would come on hard and fast and strong out of necessity. NI ROCKS – What would you hope to have achieved with The Rich and Famous by the time we get to the end of 2017 and what would you be hoping to achieve heading into the following year? NI ROCKS – Sounds good! JEFFREY – (Laughing) I would love it to be heard and people to like it and to get out and go around the world playing it. That would be my ultimate dream. To have a demand for your music and have people say I love that song. And for someone to say you guys should come over here, your song is doing well. Pick the band up, not to make a lot of money or whatever, but to get out and have a look around. That’s my dream. And it’s the same for the other guys in the band. It’s probably the same for most bands. NI ROCKS – That’s all the questions that I have. Thanks again, for taking the time to talk to Rock Radio NI. We’ll finish off by letting you pick a couple of tracks to play – either classic Kings of the Sun, something from the original Rich and Famous albums or something else. JEFFREY – From the Kings of the Sun I’ll pick “First Thing About Rock n Roll I Remember” – that’s my favourite song from then. From the Rich and Famous, “Stand Back..Prepare to be Amazed” and “Rich and Famous”, the title song.